^ Curtis Mayfield 互联网档案馆的存檔，存档日期November 23, 2006，., Rock and Roll Hall of Fame and Museum. "…significant for the forthright way in which he addressed issues of black identity and self-awareness. …left his imprint on the Seventies by couching social commentary and keenly observed black-culture archetypes in funky, danceable rhythms. …sounded urgent pleas for peace and brotherhood over extended, cinematic soul-funk tracks that laid out a fresh musical agenda for the new decade." Accessed November 28, 2006. 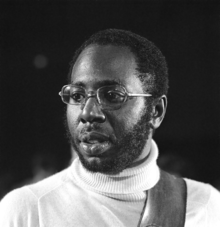 ^ "Soul icon Curtis Mayfield dies", BBC News, December 27, 1999: "Credited with introducing social comment to soul music". Accessed November 28, 2006. ^ 500 Greatest Songs of All Time. Rolling Stone. [February 9, 2015]. ^ 500 Songs That Shaped Rock. Infoplease. [9 February 2015]. ^ 500 Greatest Albums of All Time. Rolling Stone. [February 9, 2015].